10|07|09 - Today, Friday, July 9th, Italian journalists in Italy and abroad are on strike to protest the Italian government's legislative proposal to restrict reporting based on material gained from police wiretaps. 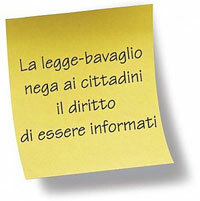 The Berlusconi government says that the law is needed to protect the privacy of individuals. The critics, however, say that the proposed law will hamper both the fight against organized crime and press reporting on corruption. However, a revised bill excludes mafia and terrorism investigations, but critics say, nonetheless, t hat it would cripple probes into offences such as money-laundering and drug-trafficking which frequently lead investigators to organised criminals and terrorists. The Federazione Nazionale Stampa Italiana (FNSI), the main Italian journalists' union, said the legislation would "severely limit the right of citizens to know how judicial investigations are proceeding, imposing serious limitations on the free circulation of information." The wiretap proposal has created a rift between the PDL ruling colaition of Silvio Berlusconi and his ally Gianfranco Fini. Fini has made his views clear clear that "a great democratic country needs strong, free and authoritative news services." The legislative proposal, which is due to be voted on in parliament on July 29, is creating a political rift and disrupting the Italian's government's plans to enact a package of austerity measures.